Founded in 1931, the Fuchs Group has grown to become the largest independent manufacturer of specialty lubricants in the world. Recognized internationally for its innovative lubricants and industry related specialty products, Fuchs has a global reach with manufacturing facilities in over 40 countries. Overlake Oil’s partnership with Fuchs Lubricants Co. provides customers with leading edge products such as food grade Fuchs Cassida and Fuchs FM lubricants and greases as well as the extensive consulting competence of our combined experts. Fuchs CASSIDA food grade lubricants portfolio includes the world’s most comprehensive range of high-performance lubricants for the food and beverage industries. 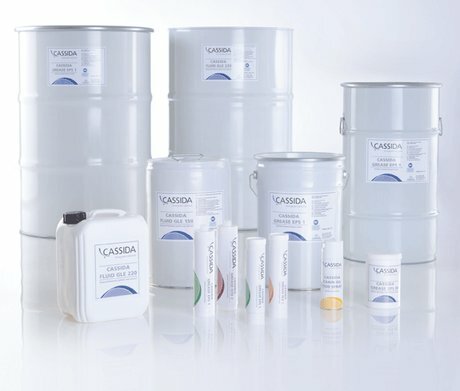 In the CASSIDA product portfolio you will find fully synthetic as well as white oil based products (FM Series), with enhanced composition to ensure optimum suitability for each application. The CASSIDA portfolio has many OEM approvals by well-known manufacturers of production and manufacturing equipment. CASSIDA products are produced in accordance with the international standard ISO 21469, ensuring that they fulfill the highest possible safety standard and are NSF registered, as well as Kosher and Halal Certified. Fuchs FM Krystall is a food-grade penetrating and flushing oil with rust preventative lubricating properties. FM Krystall cleans and lubricates conveyor surfaces, processing tables and packaging machines, is a flushing agent for bearings, gearboxes, hydraulic systems, a release agent for cutting blades, punches and dies and protects all surfaces against corrosion. Fuchs FM Grease 387 is an NLGI grade 2, high performance multipurpose grease with calcium thickener. This grease has good water resistance and prevents emulsification with water. Applications include plain and roller element bearings in wet or dry environments as well as use in slides, cams and open gears. Fuchs FM TLS 150 is a specialty anti-wear gear lubricant which is specifically designed for use in food and beverage canning total loss systems. It provides good lubrication even when operating in locations where it is subject to contamination with water, juice, and food which is held in suspension protecting metal surfaces from wear and corrosion.